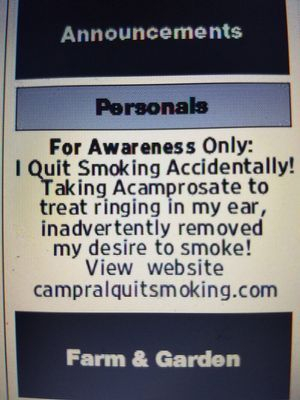 ACAMPROSATE (Campral) ACCIDENTALLY MADE ME QUIT SMOKING 12 years ago in 2006 When I was taking it for tinnitus Acamprosate might be efficacious in treating nicotine addiction in humans. These words are on abstract from Cedars-Sinai below. 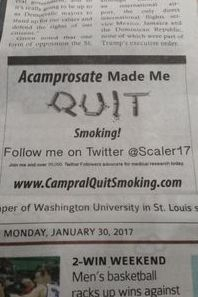 That is BIG NEWS "Not promoting or selling anything" Advocate for Medical Research today John D Allen St. Louis Mo. My E-mail scaler17@hotmail.com Twitter @IQuitSmoking_1 Phone 573-984-9349 Contact me, I'd like to hear from you. 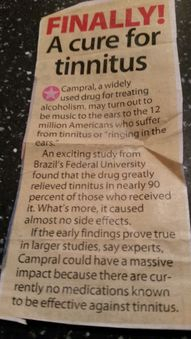 One Brazilian study has shown that acamprosate may be an effective treatment for tinnitus. 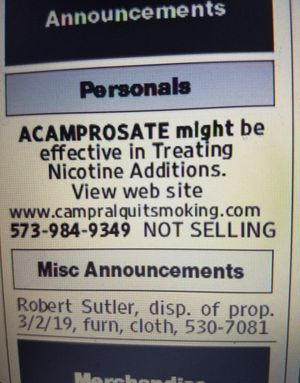 I finally found another person who quit smoking with Acamprosate Samantha Jones of Western North Carolina quit after being a smoker for 25 years. 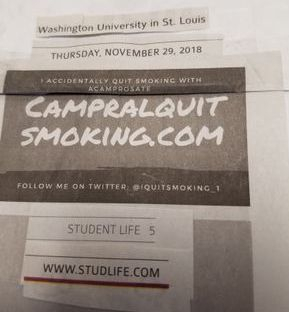 Her phone number is 828-577-7768 Her twitter link is @SJones_1 Please contact Samantha or I.
Acamprosate is used in the treatment of alcoholism; however, there is little information on its effects on nicotine addiction. 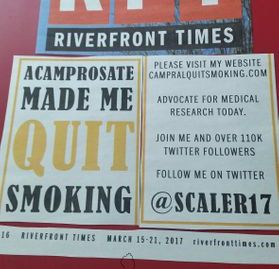 The objective of this study was to determine whether acamprosate inhibits cue-induced relapse to nicotine self-administration in the rat. Rats were trained to press a lever to obtain intravenous infusions of nicotine (0.03 mg/kg/infusion) that were associated with the illumination of a cue light. After 29 days of nicotine self-administration sessions, extinction sessions were run during which responses on the active lever did not result in the infusion of nicotine or the illumination of the cue light. After 14 days of extinction sessions the rats received twice-daily injections of saline or acamprosate (50, 100, or 200 mg/kg/intraperitoneally). Seven days later the response to the previously conditioned cue was tested, but only saline infusions were delivered. 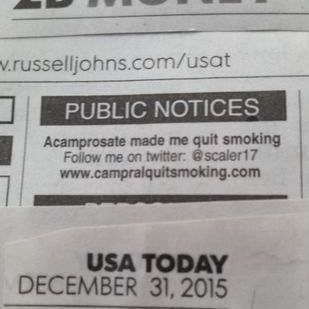 Pretreatment with all doses of acamprosate reduced responding to a cue previously associated with nicotine. 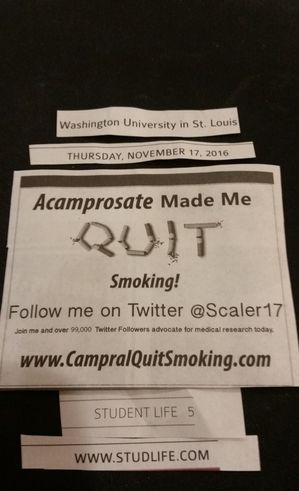 The lowest dose of acamprosate (50 mg/kg) reduced responding for the cue previously associated with nicotine infusions, but had no effect on food-rewarded behavior. 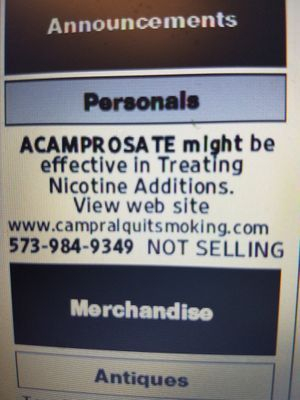 These results show that acamprosate reduced cue-induced nicotine-seeking behavior and suggest that acamprosate might be efficacious in treating nicotine addiction in humans. 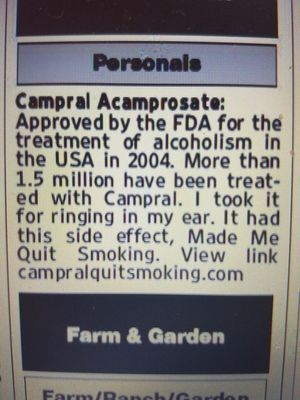 CAMPRAL was approved by the Food and Drug Administration for the treatment of alcohol dependence or alcoholism in the United States in 2004, but it has been used widely in Europe for many years. 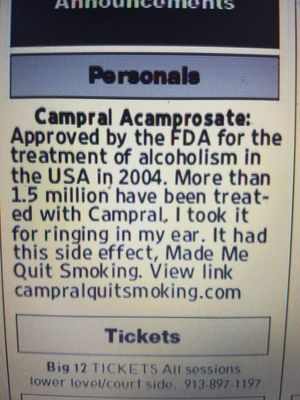 More than 1.5 million people have been treated worldwide with Campral. J Addict Med. 2009 Sep;3(3):164-71. doi: 10.1097/ADM.0b013e3181917d53. Effects of nicotine and illicit substance use on alcoholism treatment outcomes and acamprosate efficacy. 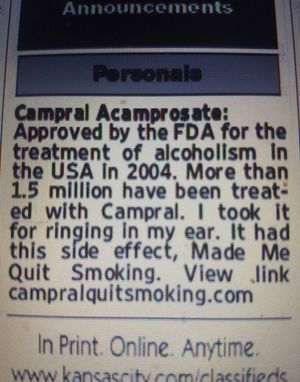 : To evaluate the effect of current smoking and lifetime illicit drug use on alcoholism treatment outcomes and to assess whether these factors influence acamprosate efficacy. : This is a secondary analysis of data from the intention-to-treat population (N = 601) in a 6-month, randomized, placebo-controlled US trial of acamprosate (2 or 3 g/d). Patients met Diagnostic and Statistical Manual of Mental Disorders, 4th Edition criteria for alcohol dependence and no other dependence disorders other than nicotine or cannabis, although patients with recent substance use were included. Baseline severities of current nicotine dependence and lifetime drug use were determined using the Fagerström test of nicotine dependence and the illicit drug use inventory, respectively. The primary endpoint was rate of good response (abstinence from alcohol for ≥90% of trial). Secondary endpoints were rate of controlled drinking (≤5 drinks/d for ≥90% of trial), percent days abstinent, and percent days controlled drinking. The effect of smoking, drug use, treatment, and any interactions on study endpoints was assessed by a backward selection process to eliminate nonsignificant variables. : In the intention-to-treat population, 44.9% of patients were current smokers and 78.7% reported lifetime illicit drug use. Current nicotine dependence and lifetime illicit drug use were significant negative predictors of rates of good response (nicotine: odds ratio [OR] = 0.56, 95% confidence interval [CI] = 0.35-0.88, P = 0.01; illicit drugs: OR = 0.47, 95% CI = 0.31-0.71, P < 0.01) and all other secondary outcomes. 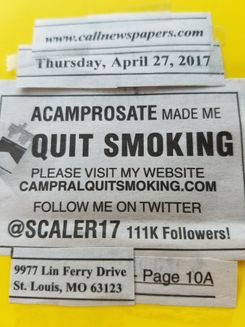 Acamprosate had a significant positive effect on rate of good response (OR = 1.65, 95% CI = 1.08-2.52, P = 0.020) and all other secondary outcomes. 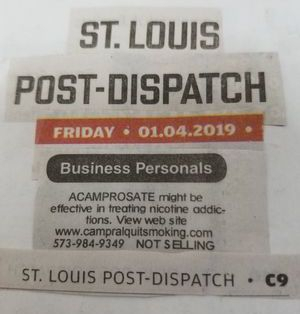 : Current nicotine dependence and lifetime illicit drug use were found to have a significant negative impact on alcoholism treatment outcomes, but no impact on the significant positive effects of acamprosate. 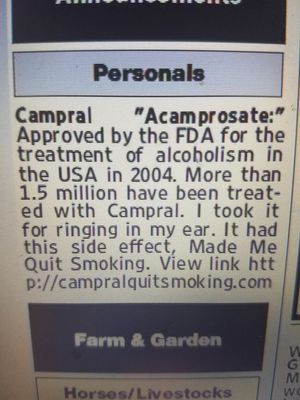 The effect sizes of smoking, drug use, and acamprosate are equivalent and thus, treatment with acamprosate may offset some of the negative effects of smoking or drug use on alcoholism treatment outcomes. 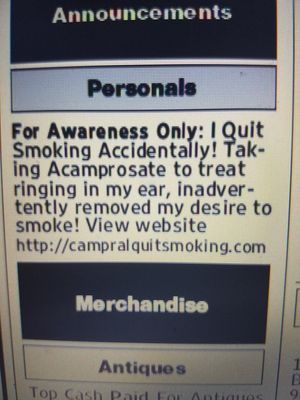 Will the medication Campral help curb cigarette cravings? 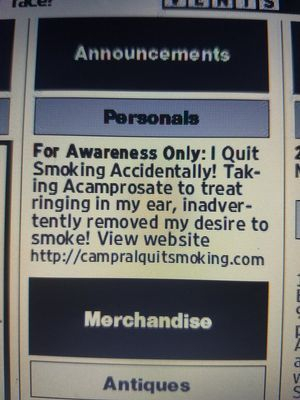 I am a moderate smoker. I can take it or leave it without much discomfort. 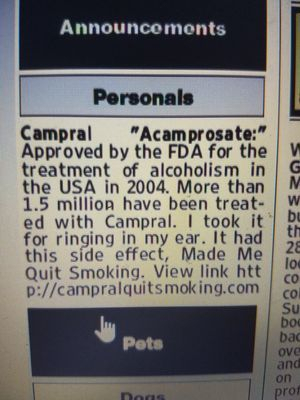 I take Campral to help curb my craving to drink. I have noticed that I don't really crave a cigarette as bad since I have been taking the medication. 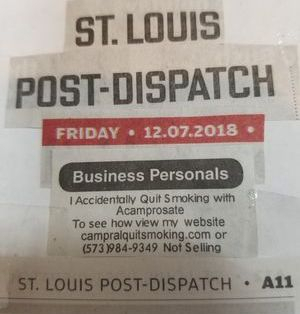 I have a friend who has a very serious smoking problem. 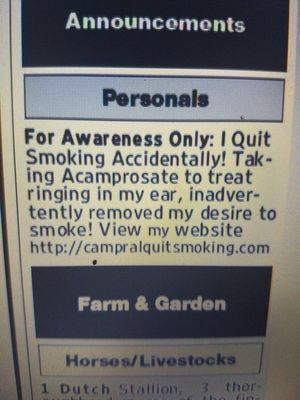 I was wondering if Campral would help with her fight her cigarette addiction. Even though I have heard from other people benefiting from campral, I would recommend chantix. 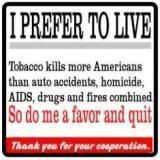 I know several people who have been smoking for over 20 years that have quit using it. To: Pechnick, Robert N., Ph.D. In your opinion do you thing I'm doing the right thing ? Not really. I am afraid that you are wasting your energy. I am very happy for you that you were able to stop smoking and I really appreciate your enthusiasm. But as the writer of one of your e-mails said, modern science is based on what they call "evidence-based" research. There are a lot of amazing cures reported by people, but they don't hold up when tested in larger groups. 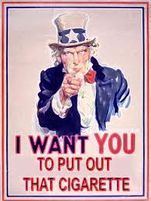 We see this all the time in various ares of medicine, such as people how have experienced remarkable cures for cancer. The problem is that these "cures" don't always hold up when tested in the general population Everybody is different in terms of their bodies, their chemistry and individual physiology, diet, life experience, etc. So drugs have to be tested in large groups of people generate enough evidence to see if the findings hold up. However, these kinds of trials are very, very expensive, usually costing 10- 100 million dollars! No drug company is going to pay for that unless they can make a profit on the eventual sales of the drug. The government, through the National Institutes of Health, might fund some limited studies, but with the current budgetary problems it is very difficult to get grants funded. I can tell that you are frustrated because it seems like nobody is listening, and for the most part they aren't. 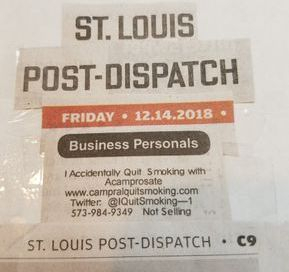 What I would suggest is putting your energy and enthusiasm into posting your experience on boards where people go who are trying to stop smoking. 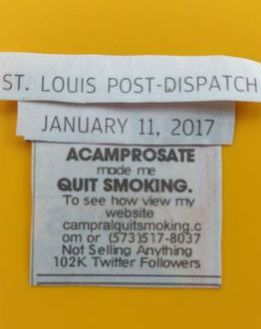 This way maybe you will help some people who are trying to stop and perhaps find others who have had a similar experience with acamprosate. 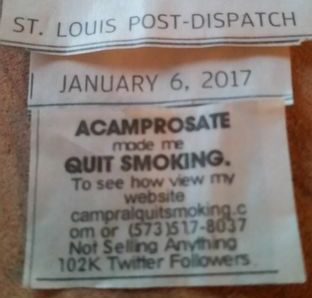 I will say that your success using acamprosate and enthusiam has inspired my colleagues and I to think about doing additional followup studies. I have enjoyed our correspondence and I wish you the best of luck. I have had a brief look at your website and will try and find some time this week to go into it in more detail. The articles are rather technical so I have to read them slowly and repeatedly to understand what they are about. In his email of 20 May 2011, Robert Pechnick talks about the type of research required, costing between $10 - 100 Mil. However, I somewhat doubt if it needs to start off with such I large amount. 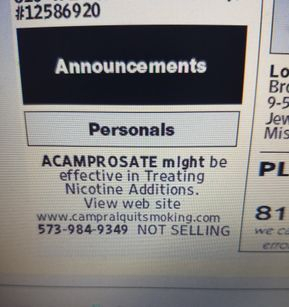 I am not qualified in the fields of pharmacy or medicine, however, I would think that, as this medicine is already registered for alcohol treatment it should be relatively easy to get an approval to carry out preliminary tests on nicotine treatment. I would imagine a first screening test could be done for a few hundred thousand dollars. It may be an option to try and find a university department who would be interested in undertaking such a screening trial. Their report would obviously also include a review of all the research done to date. The big question is; why have the manufacturers not undertaken such research themselves. If it works like you say it does then they should be able to make a lot of money out of it even if they have spent a couple of hundred million dollars to get it registered. So why are they not interested. They must know something we do not. If you could discuss the subject with someone in the know you might find out what it is that prevents them from taking this matter further. Hope these thoughts are some help. Subject: Nicole M Brown (@authornursenmb) replied to one of your Tweets! NMDA receptor blockade: A novel avenue for tobacco intervention? The N-methyl- D-aspartate (NMDA) receptor is a glutamate activated ion channel involved in central excitatory pathways that are critical in higher brain functioning such as learning, memory and certain behaviors . Additionally, excessive NMDA receptor stimulation is involved with chronic pain, addiction , and neuronal cell death (also know as excitotoxicity) . Nicotine use enhances glutamate (excitatory) transmission via the NMDA receptor while at the same time desensitizing GABA (inhibitory) transmission within brain reward pathways. Nicotine acts on pre-synaptic nicotinic acetylcholine receptors (nAChR) of glutamate efferents located within the prefrontal cortex. These efferents project to the ventral tegmental area (VTA) . When stimulated, there is increased glutamate release from these efferents into the VTA. Here, the increased glutamate interacts with NMDA receptors located post-synaptically on VTA dopamine neurons that project into the shell of the nucleus accumbens, increasing their firing rate . 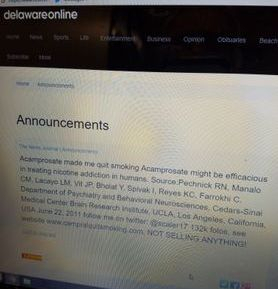 Simultaneously, nicotine desensitizes GABA receptors , in essence inhibiting this inhibitor of dopamine release. The net result is increased dopamine release into the shell of the nucleus accumbens which is responsible for the rewarding and addictive properties of many drugs of abuse, including nicotine. From these observations, it appears that NMDA receptors may play a role in nicotine use, and that blockade of these receptors may reduce the nicotine-induced excitatory glutamate response with the VTA . Hypothetically, such a blockade may have therapeutic implications for tobacco cessation. 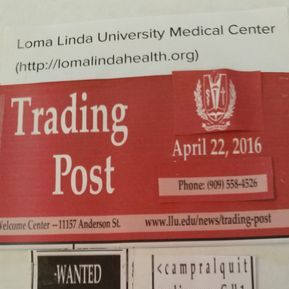 Two currently marketed drugs – memantine (Namenda) and acamprosate (Campral) – have activity against the excitatory effects of glutamate. Memantine is a low affinity NMDA receptor antagonist with weaker antagonism at nicotinic acetylcholine receptors . It has been approved for use in Alzheimer’s disease, likely exerting its action by ameliorating glutamatergic excitotoxicity. There is also evidence that memantine may have a positive role in nicotine abuse , although a pilot study among 40 smokers  revealed that memantine helped only with certain aspects of nicotine’s effects and did not facilitate smoking reduction. It should be noted that, while memantine did not help with smoking reduction in that study, there were trends toward decreased craving scores that failed to reach statistical significance likely due to a small sample size . Importantly, memantine is not associated with a significant frequency of adverse events. 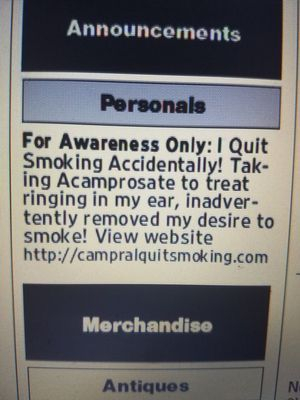 Acamprosate. 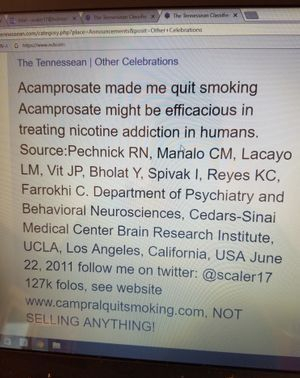 It has not been studied in connection with nicotine use. 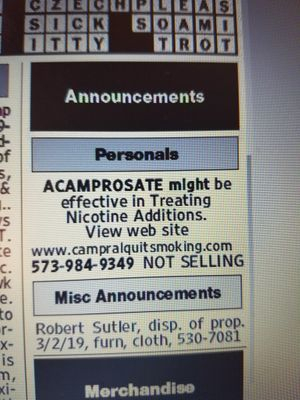 Aside from occasional diarrhea with acamprosate, both drugs are generally well tolerated and thus appear safe for testing in smoking cessation. Addict Biol. 2016 Mar;21(2):234-41. doi: 10.1111/adb.12190. Epub 2014 Oct 13. Nicotine-induced locomotor sensitization: pharmacological analyses with candidate smoking cessation aids. Goutier W1, Kloeze M1, McCreary AC1. There are a number of approved therapeutics for the management of alcohol dependence, which might also convey the potential as smoking cessation aids. The present study investigated the effect of a few of these therapeutics and potential candidates (non-peptide vasopressin V1b antagonists) on the expression of nicotine-induced behavioral sensitization in Wistar rats. The following compounds were included in this evaluation: rimonabant, bupropion, topiramate, acamprosate, naltrexone, mecamylamine, nelivaptan (SSR-149415, V1b antagonist) and two novel V1b antagonists. Following the development of nicotine-induced locomotor sensitization and a withdrawal period, the expression of sensitization was assessed in the presence of one of the examined agents given 30 minutes prior to the nicotine challenge injection. 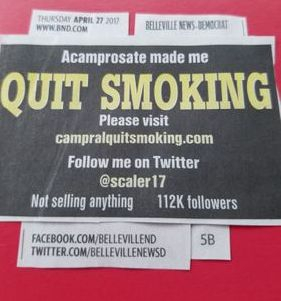 Acamprosate, naltrexone, rimonabant, mecamylamine, nelivaptan and V1b antagonist 'compound 2' significantly antagonized the expression of nicotine-induced sensitization. Whereas topiramate showed a trend for effects, the V1b antagonist 'compound 1' did not show any significant effects. Bupropion failed to block sensitization but increased activity alone and was therefore tested in development and cross-sensitization studies. Taken together, these findings provide pre-clinical evidence that these molecules attenuated the expression of nicotine-induced sensitization and should be further investigated as putative treatments for nicotine addiction. Moreover, V1b antagonists should be further investigated as a potential novel smoking cessation aid. Psychopharmacology (Berl). 2007 Dec;195(3):397-406. Epub 2007 Sep 2. Acamprosate attenuates cocaine- and cue-induced reinstatement of cocaine-seeking behavior in rats. Bowers MS1, Chen BT, Chou JK, Osborne MP, Gass JT, See RE, Bonci A, Janak PH, Olive MF. 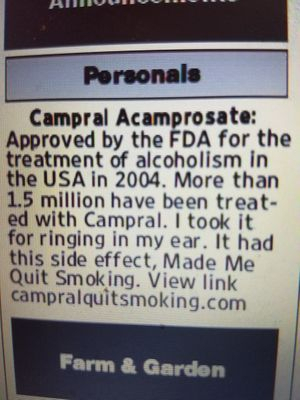 Acamprosate (calcium acetylhomotaurinate) is a glutamatergic neuromodulator used for the treatment of alcoholism, but its potential efficacy in the treatment of psychostimulant addiction has not been explored. The purpose of this study was to assess the effects of acamprosate on cocaine-stimulated locomotor activity, cocaine self-administration, and cue- and cocaine-induced reinstatement of cocaine-seeking behavior. All experiments utilized once-daily treatment for 5 consecutive days. First, the effects of saline or acamprosate (100, 300, or 500 mg/kg intraperitoneally) on body weight were examined. On the last day of treatment, locomotor activity was assessed before and after drug treatment, after which all animals received an acute challenge of cocaine (10 mg/kg). Next, a separate group of rats were trained to intravenously (IV) self-administer cocaine (0.6 mg/kg per infusion), subjected to extinction procedures, and then tested for effects of acamprosate on cue- or cocaine-induced reinstatement. A third group of rats was trained to self-administer cocaine as described above and were treated with saline or acamprosate before daily IV self-administration sessions. Repeated administration of 500 mg/kg acamprosate but not lower doses produced reductions in both body weight and spontaneous locomotor activity, and thus this dose was not tested further. 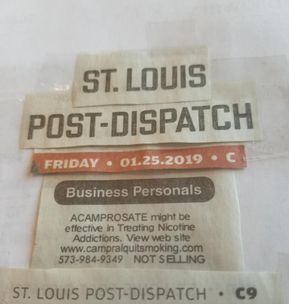 Acamprosate at 300 mg/kg but not 100 mg/kg attenuated both cocaine- and cue-induced reinstatement without altering baseline patterns of cocaine self-administration or cocaine-stimulated hyperlocomotion. 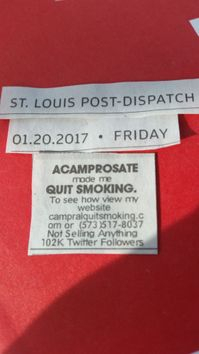 Acamprosate attenuates both drug- and cue-induced reinstatement of cocaine-seeking behavior, suggesting that this compound may serve as a potential treatment for preventing relapse in cocaine-addicted humans. Thanks for your email. 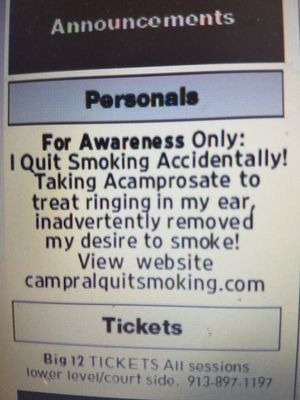 I’ll be sure to look at your Youtube video regarding Campral. 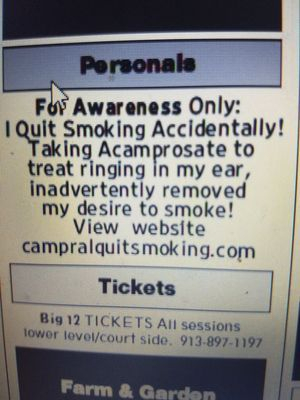 Also, the American Lung Association does not endorse specific drugs due to liability/legal issues. Thank you for sharing this information with me! Donation will be use for Bigger & Better ads, Medical Research, Computer equipment, Etc. 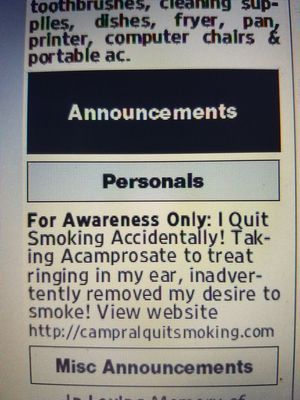 Need more ads to get the attention of the American Lung Assoc. & other Medical org.